Sat., April 14, 2018, 1:57 p.m.
Q. Dear Tim, I need your help. 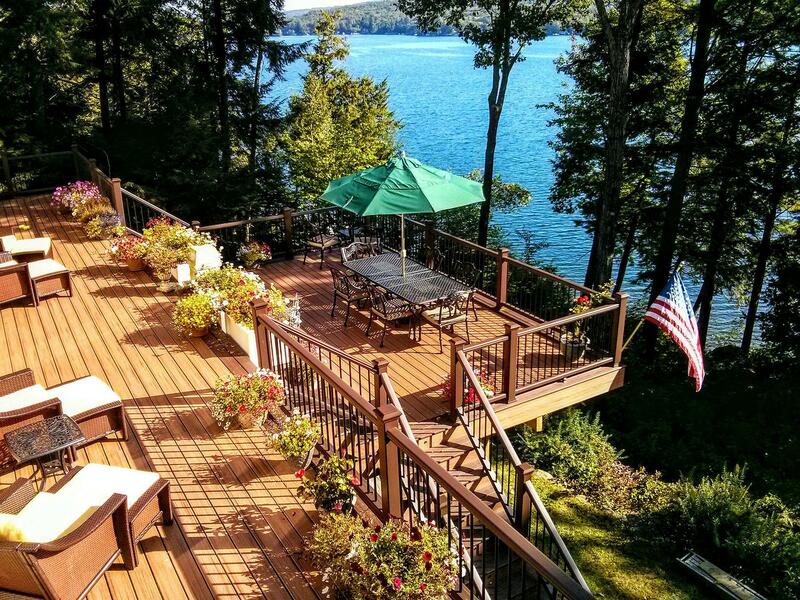 I own a summer home on a lake that has a dock and large deck. I’ve also got my primary home, which has an outdoor patio surrounded by huge trees and expensive landscaping. All of these things, as well as the siding on my home, need to be cleaned. Online research has yielded a lot of contradictory advice. Some websites say to use chlorine bleach and water to clean everything using a 1:1 ratio. Others say to use oxygen bleach. What would you use and why? – Brad, Worcester, Mass. A. Brad’s question reminds me of a dinner I had 22 years ago with a physical chemist. Ten days earlier, I had started to do research for my first-ever deck cleaning column. Before I share what happened at the dinner, allow me to tell you what I knew before meeting the chemist. Back in the mid-1990s, all the information out there said to use chlorine bleach to clean decks and patios. I knew this was not the best practice because of what my next-door neighbor did each spring. She always poured three or four gallons of pure chlorine bleach onto her concrete patio stepping stones that were under a majestic maple tree. She spread it around with a push broom to clean the patio, and the bleach seeped down into the soil. The fumes were so powerful they made me sick. I warned her that the chlorine was so toxic it would kill the tree. She frowned at me and told me to mind my own business. Each year, more and more of the tree died. Eventually, After my neighbor had spent thousands of dollars on root treatments and injections, a company finally came and cut it the poor tree down. It destroys the lignin fibers that hold wood together. It removes the natural color of the wood. It’s highly corrosive to metal fasteners and framing connectors on wood decks. It will poison ponds and lakes. At dinner, the chemist introduced me to oxygen bleach. I thought chlorine bleach was the only bleach out there. I was wrong. It turns out oxygen bleach had been around for decades. This product is a powder that’s mixed with water. Once you mix it, it releases trillions of invisible non-toxic pure oxygen ions into the solution. These ions are powerful cleaners, blasting and blast apart organic stains, mold, mildew, algae, sun-damaged deck sealers, cooking grease, etc. It’s safe to use on docks, as the solution that drips into the water adds needed oxygen to the lake or pond. The best part is the oOxygen bleach doesn’t harm any vegetation or trees. It doesn’t remove the color from anything. It doesn’t harm the lignin in natural wood. Oxygen bleach is completely safe for all composite decking, vinyl siding, fiber cement siding and outdoor furniture of all types. The more the chemist told me about this magical product, the more intrigued I became. It turns out iIt was developed for the hospitality and hospital industries. Hotels, motels and hospitals were tired of spending vast amounts of money replacing bedding ruined by washing it with chlorine bleach. Oxygen bleach was both color and fabric-safe.! In the late 1980s, an enterprising entrepreneur found out about oxygen bleach and introduced it to consumers like you and me. He started out selling it as a carpet cleaner at small home and garden shows. Soon, he was advertising his brand on TV. Fast forward to 2018 and now there are any number of oxygen bleach brands out there that you can buy. Some are certified organic and some are not. It’s probably a good idea to use a certified organic one for outdoor use. if you want to ensure you don’t damage any of your expensive outdoor possessions. The certified organic brands are also safe to use around all vegetation. I’ve created a free downloadable document for you at my website. This document contains a list of all oxygen bleaches I’m aware of. It also has links to videos, one of them showing why you do NOT want to use a pressure washer to clean your wood deck or teak outdoor furniture. A pressure washer can ruin anything made from wood. Just go to: http://go.askthebuilder.com/B1242 to get the free PDF document. Published: April 14, 2018, 1:57 p.m.